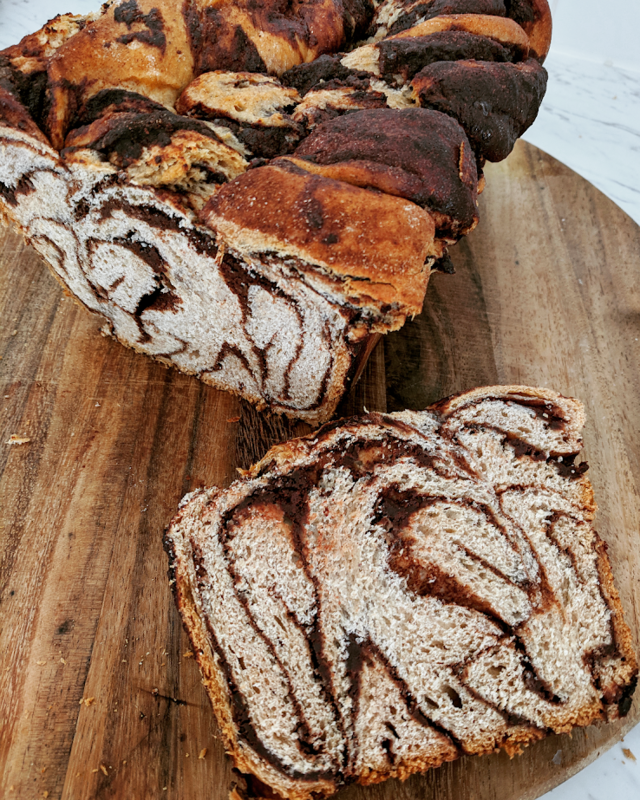 Babka always makes a wonderful dessert, morning tea snack or sweet treat for sharing. It's made up of that winning combination of bread and chocolate, which are two of my favourite things, and is so versatile allowing for different types of fillings, spices, and flavours. If you're not planning on serving it for a group, cut it into pieces, place in the freezer and heat when you're ready to enjoy (the chocolate will melt a little too - yum!). In a large jug, combine yeast, milk and sugar and stir to combine. Set aside for 10 minutes. In the bowl of a stand mixer fitted with a dough hook or a large bowl, combine flour, sugar, salt and cinnamon and mix for 30 seconds, either with the dough hook or a spatula. Add egg mixture, butter, milk and vanilla, alternating between each one and the wet mixture becomes incorporated. If using a stand mixer, once all ingredients are in the bowl, mix for 5 minutes. Place dough into a greased bowl, cover with tea towels and leave for 1.5 hours. Grease a large loaf tin and set aside. Once the dough has risen, split dough in half and roll out into a rectangular shape on a well floured surface, adding flour whenever the dough sticks to your surface. Preheat oven to approximately 190 degrees Celsius. In a small bowl, combine chocolate, butter and sugar. Spread filling onto the dough and sprinkle with cinnamon. Starting from the long side closest to you, roll up each piece until you have two long logs. Cut each log down the middle to create four long logs. Place dough into prepared tin and top with butter, cinnamon sugar, extra chocolate or hazelnuts, and place into the oven to bake for approximately 40 minutes, or until starting to brown on top but just cooked through in the middle. Remove from tin and serve warm or store in an airtight container at room temperature. It also freezes well, too!